Eclectic Paperie is sponsoring a prize this month over at the Mixed Media Challenge Blog. They asked me to join in their challenge as a guest designer, which this month is stencils and modeling paste!! (My two favorite art supplies!!) So honestly, you have two chances to win an eP prize this month ... one here at the ePlay challenge (which starts on the 7th!) and one at the Mixed Media Challenge blog!! Score!! When we were at the beach this summer I saw this beautiful egret sitting at the waters edge. She looked so peaceful and regal that I knew I had to sketch her and keep her forever. I started the background by using a roller stamp onto a blank canvas. Then I used tissue paper on my gelli plate to make my pink sunset for behind the egret. I tried to make it as ombré as possible! (This was harder to do than I thought it would be!!! ) When the tissue paper was dry, I used gel medium to adhere the tissue paper to the canvas. I love the effect because you can see the roller text behind the tissue paper! I also wanted to create the blue ocean with a wavy texture. I painted teal onto the canvas. I mixed the same teal with modeling paste And painted the paste the through the stencil to create a texture. I used the same stencil as the feathers! The I used my sketch to help me cut out a large bird silhouette out of watercolor paper. I used the watercolor paper to make sure the paper wod be strong enough to add the modeling paste 'feathers' to it! I did paint some gray and white paint onto the paper, but in the end, you can't even see it! After about 24 hours, the modeling paste was completely dry. It peeled right off of the parchment paper and held its shape. I took the 'feathers' and layered them on top of each other. I cut out little triangle for the neck. I used gel medium as my adhesive! And with some glue to attach the bird to the canvas, a couple of doodles and a favorite quote - Done! I LOVE how you created the egret, Karen! And the background is gorgeous!! Absolutely STUNNING, Karen! 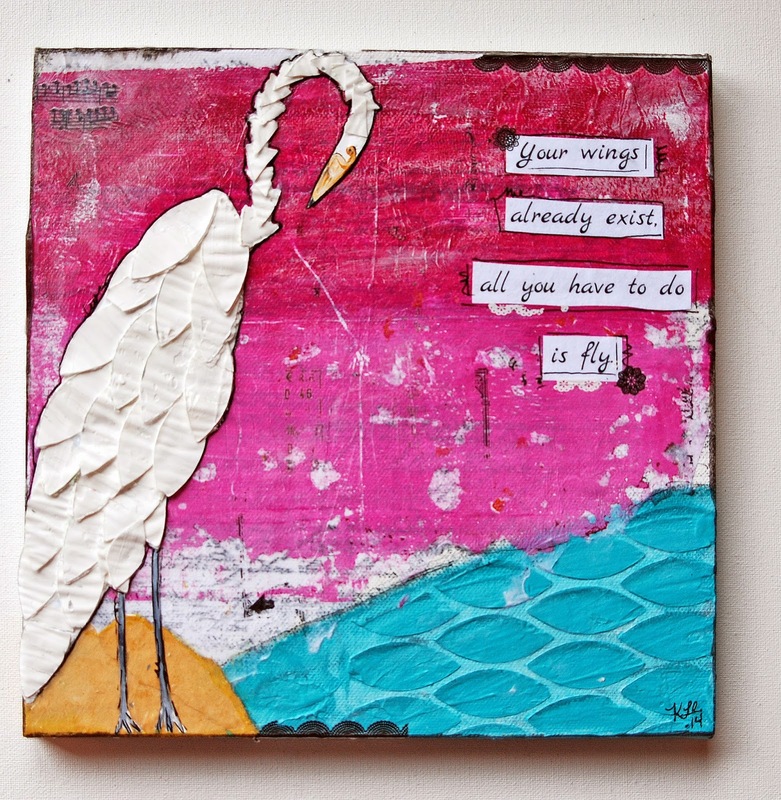 LOVE the process and the colors and that FAB egret! WOW! This was really nice... An eye catcher, loving the colors and the feathers...uh! Loved it! Really beautiful and so creative how you used the modeling paste! Thanks so much for sharing! what a great project Karen! love the 'water' you stenciled and the red sky!